It is summertime and never like at this time of year there is so much fruit available. Melons, watermelons, peaches, nectarines, apricots, plums and figs are the classic Italian summer type of fruits. Because they are in season they are very sweet and juicy and it is easy to have one after the other. When you start you cannot stop! The best would be to get them straight from the tree where they are at their best. When it is hot you need plenty of fruit and vegetables as they contain lots of water and can help you cope with the heat. So, this is the best time to use all the fruit available to make nice cakes and tarts. I made the shortcrust pastry for this tart in the evening and in the morning I just put the fruit on it, so we could all have a nice summery breakfast in the garden. Put the flour on your working top, make a hole in the middle and add the egg, salt, sugar and the cold butter cut into cubes. With your hands incorporate the ingredients quickly and make a smooth dough. Put it in the fridge wrapped in a cling film for 30 minutes. Take it out of the fridge and with the help of a rolling pin flatten the pastry. Add a little flour if you find it difficult. Put the pastry on a round baking tin for tarts, pinch it with a fork all over and cook at 180 C for about 20 minutes. When it is cooked spread 2 tbsp of jam on it. Cut the peaches into half moons and lay them nicely on the tart. Mix 2 tbsp of jam and 2 tbsp of water in a sauce pan and cook for 5 minutes; pour it on the tart over the peaches. I am entering this into the One Ingredient challenge, hosted this month by Nazima of Working London Mummy, but hosted on alternate months by Laura of How to Cook Good Food. Just the perfect month to choose peaches and nectarines! 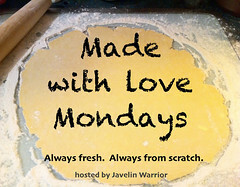 Also I am enterering this to the weekly "Made with Love Mondays" challenge hosted by my dearest friend Javelin Warrior. sunshine yellow……such a happy sight….gorgeous pie! I have never made anything sweet with peaches but this year I am thinking to use my own home grown peaches. Just waiting them to get ripe to create something delicious like your peach tart. A marvelous pie! good like with your entries! Very tempting, beautifully done Alida..
Sunshine on a plate – I can't think of a better summery breakfast. Lovely tart! Beautiful colour and Love the idea of having it for breakfast. Such a gorgeous peach tart! un pastel de maravilla está hermosa y seguro muy deliciosa,abrazos y abrazos. This looks so pretty and summery. Thanks for thinking of us and entering it to AlphaBakes – a lovely entry! "Purty" Peaches in a tart, I don't think it gets much better than that for Summertime eats, Alida. Simply delicious looking…Thank you so much for sharing…P.S. Now I'm off to check out that Rosemary Pizza of yours!!! Que preciosidad, que pinta tiene esta tarta de melocoton. Now that tart looks fantastic Alida. I hardly ever use peaches and I don't really know why because they are delicious. What a lovely tart….this for breakfast on a holiday is heavenly indeed!